This site is generously sponsored by Virginia Classic Mustang. The Parts page may be of particular interest to carryover owners and enthusiasts. All of the 1965-68 Mustangs with the 9 inch rear end assembly had a special shield over the center section. On the top of this shield was a rubber bumper as pictured here. Since the ’66 GT350’s were all K Code Mustangs, they, of course had the 9 inch rear. This Pinion Snubber Rubber Bumper is now available as a brand new part from Virginia Classic Mustang. 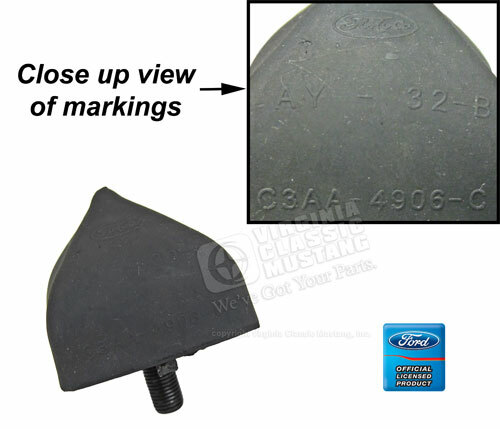 This rubber bumper features the correct markings with the C3AA part number and the FoMoCo Oval Script.